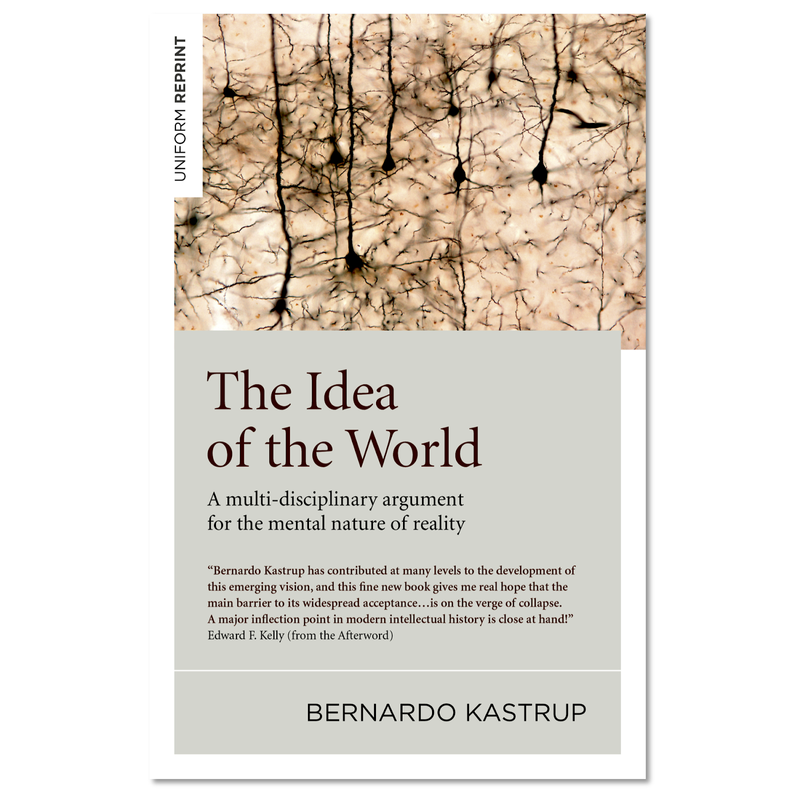 My new book, The Idea of the World, is now available on amazon.com, amazon.co.uk, other online retailers and many bookshops as well. To mark the occasion, I am publishing below two of the first sections of the book, which explain what the book is about and the role it plays in the context of the body of my work. I hope you find value in it! And if you cannot afford the book, remember that the 10 academic papers comprised in it can be freely downloaded from my papers page. You will miss the many additional chapters and the overall argument built around the papers and the added material, but you will get some of the key pieces of the puzzle. Prior to the present volume, I have written six books elaborating on my views regarding the underlying nature of reality. Particularly in Why Materialism Is Baloney and More Than Allegory, in addition to a conceptual exposition I have also made liberal use of metaphors to help readers develop direct intuition for the ideas expressed. My intent was not to win a technical argument in a court of philosophical arbitration, but to evoke in my readers a felt sense of the world I was describing. As such, my work has had a character more akin to continental than analytic philosophy. I have no regrets about it. Yet, I have also come to recognize the inevitable shortcomings of the approach. Some readers have misinterpreted and others over-interpreted my metaphors, extrapolating their applicability beyond their intended scope. Yet others have simply become overwhelmed or confused by the many metaphorical images, losing the thread of my argument. Perhaps most importantly—given my goal of providing a robust alternative to the mainstream physicalist metaphysics (Kastrup 2015: 142-146)—some professional philosophers and scientists felt they needed to see a more conceptually clear and rigorous formulation of my philosophical system before they could consider it. Incomplete as the subset of ideas presented here may be, I shall argue that it is still more complete than the current mainstream metaphysics. This subset alone—as I elaborate upon in the pages that follow—should be able to explain more of reality, in a more cogent way, than physicalism. By articulating the corresponding ontology precisely, my intent is to deny cynics and militants alike an excuse to portray it as vague and, therefore, dismissible. If the price to achieve this is to write a book as if one were arguing a case in a court of law, then this book represents my case. You be the judge. The main body of this work brings together ten different articles I published in peer-reviewed academic journals. Unbeknownst to the journals’ editors, the articles were conceived, from the beginning, to eventually be collected in the volume you now have in front of you. Despite being self-contained, each was designed to fit into a broader jigsaw puzzle that, once assembled, should reveal a compelling, holistic picture of the nature of reality. This book presents the completed jigsaw puzzle. The resulting picture depicts an ontology that squarely contradicts our culture’s mainstream physicalist metaphysics. Indeed, according to the ontology described and defended here, reality is fundamentally experiential. A universal phenomenal consciousness is the sole ontological primitive, whose patterns of excitation constitute existence. We are dissociated mental complexes of this universal consciousness, surrounded like islands by the ocean of its mentation. The inanimate universe we see around us is the extrinsic appearance of a possibly instinctual but certainly elaborate universal thought, much like a living brain is the extrinsic appearance of a person’s conscious inner life. Other living creatures are the extrinsic appearances of other dissociated complexes. If all this sounds implausible to you now, you have yet more reason to peruse the argument carefully laid out in the pages that follow. Each of the ten original academic articles constitutes a chapter in this volume, organized so as to present an overarching argument step by step. I have added five extra preamble chapters, as well as an overview and extensive closing commentary, to weave the original articles together in a coherent storyline. The choice to break up my argument into ten self-contained, independently published articles had three motivations. Firstly, I have been criticized for not submitting my earlier work to the scrutiny of peer-review. I take this criticism only partly to heart: peer-review can be a prejudiced process that stifles valid non-mainstream views whilst overlooking significant faults in mainstream arguments (Smith 2006, McCook 2006, Baldwin 2014). As an author whose ideas systematically defy the mainstream, I had doubts about whether my articles would receive an impartial hearing. And indeed, often they didn’t. Nonetheless, peer-review can also be constructive, insofar as it provides penetrating criticisms that help sharpen one’s arguments. This was my hope and, as it turns out, several of my original manuscripts were significantly improved thanks to insightful comments from reviewers. In the end, peer-review has proven to be fruitful. Secondly, specialized articles can reach more and different people in academia than a more generic book. The articles collected in this volume span fields as diverse as philosophy, neuroscience, psychology, psychiatry and physics, each with its own academic community. By publishing the articles in journals specifically targeted at their respective communities, I hope to have reached people who will probably never hear of—or be interested in—this book as a whole. Thirdly, by having each part of my broader argument receive the specialist endorsement that peer approval represents, I hope to deny cynics and militants an excuse to portray the ontology presented here—antagonistic to current mainstream views as it is—as dismissible. No transfer of copyright required from authors (so to safeguard my ability to republish the articles in this volume). To the extent possible within these constraints, I have also sought broader geographical exposure for my work by publishing in journals spanning North America, Western, Central and Eastern Europe. In order to preserve the integrity of the original peer-review process, I am reproducing the ten original articles here without any change of substance. I have only corrected the occasional typo and language inaccuracy, harmonized the terminology and ensured consistency—citation style, section and figure numbering, etc.—across the entire book. I have also consolidated all references in the bibliography at the end of this volume, so to reduce redundancy. Everything else is as it was originally published in the respective journals. Whenever I felt that an update of—or comment on—specific passages was called for, I have done so in the form of added footnotes, so to preserve the original text. For this reason, and since the original articles had to be self-contained, some repetition of content occurs across chapters. Some readers may consider this annoying, but I think it has a positive side effect: it provides a regular recapitulation of key ideas and context throughout the book, helping the reader keep track of the overarching argument line. Finally, because the main substance of this work can already be found in ten freely accessible articles, it is important to highlight that the value-add of this book consists in my effort to weave the articles together in a coherent storyline, building up to an overarching ontology. By downloading the original articles one can get the pieces of the jigsaw puzzle, but by reading this book one gets the overall picture the pieces form when properly connected together. It is my sincere hope that this picture helps you come to new insights about the nature of reality. ** This was the latest version of Beall’s list available as of the time of this writing. Jeffrey Beall had then just stopped maintaining the list, so this is possibly the last version as well. I'm a great fan of all your works. And regularly refer to your ideas on my FB book page on consciousness, science and spirituality. Looks like everyone is doing this to you Bernardo...sorry...I thought I had your email. The people who tune in are mostly friends in a forum area, in which your name comes up occasionally. This is me talking about a show called Unbelievable, but then we get onto the fundamental nature of Consciousness. I'm glad you are finally getting more prominence, you deserve it. I have just read your article on Scientific American and will soon read your book. "To say that information exists in and of itself is akin to speaking of spin without the top, of ripples without water, of a dance without the dancer, or of the Cheshire Cat’s grin without the cat. It is a grammatically valid statement devoid of sense; a word game less meaningful than fantasy, for internally consistent fantasy can at least be explicitly and coherently conceived of as such." with the Quantum Cheshire Cat experiment? Not really. The whole thing is a simulation. I just finished The Idea of the World, and wanted to let you know how much I loved it. 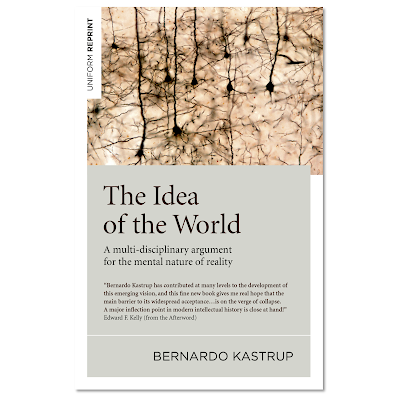 I have been a follower of nonduality through Buddhism and Vedanta for many years, but I found your case for idealism, through a modern lens, to be especially helpful. It gave me a much deeper felt sense of reality as pure experience. So again, thank you! I am very grateful for the approach you take and the work you do.